Why is this happening - only because of diameter size - 1 mm? Or i am doing something wrong? How to avoind this in engraving? I've used "area" to make pathes. but LinuxCNC rounds the path to increase the processing speed. 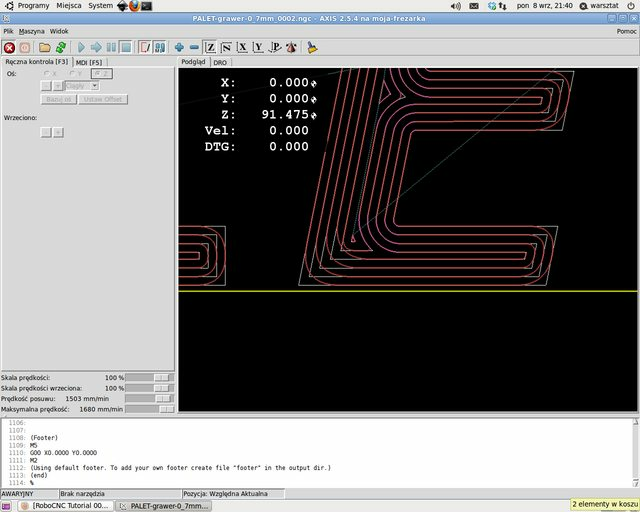 You can use the G61 at the beginning of the program file, then LinuxCNC will move exactly along the path. Or you can use the G64 P0.1 - in this case, rounding is not more than 0.1 mm. This heleped me a lot - now everything is like it should be but i think my machine now is not working good - those are some of first cut and engravings with my cnc. This problem is not the result of selecting rounding mode (G61 / G64). Your machine (motors) lost steps. Possible cause of of missed steps - is too high acceleration. Perhaps the reason for the lost steps are electrical interference. Now is much better, one screw was no tight now it's not perfect but ready for more testing and tunning my cnc -this one was without G61.